Are you considering building an A-Frame house plan? If so, take a little time to learn about these special home plans. 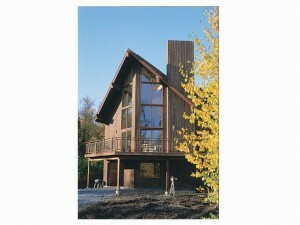 For many, A-Frame house plans are most notably recognized for their steeply sloped roofs resembling an “A” shape. This strategic design feature is especially prevalent in colder climates because it helps the snow fall to the ground. May A-Frames sport a rustic exterior allowing them to blend well on a wooded lot or a long a lakeshore. Inside, A-Frame floor plans often incorporate vaulted ceilings and tall windows which promote the enjoyment of panoramic vistas of the surrounding landscape. In many cases, the vaulted ceiling creates an upper level living space such as a loft that can be use for a variety of things including an office, sleeping space for guests or a quiet reading area. Other design features typical of A-Frame house plans include an inviting central living areas, gable ended roofs and large, uncovered decks and wrap-around porches. A-Frame home plans are closely related to chalets and are well suited for many types of terrain making them ideal for use as mountain houses and coastal homes. They also work well on sloping and hillside lots. Furthermore, A-Frame home plans share some commonalities with various vacation house plans, contemporary homes and waterfront designs. They are available in many sizes ranging from a simple one-bedroom weekend retreat to larger floor plans designed for permanent residences. 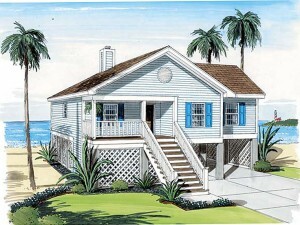 Some A-Frame house plans are even built for rental property in resort areas. No matter why or where you plan to build an A-Frame home, you’ll be pleased to know these special house plans always deliver relaxed living.